Planet of the Apes is the working title of NetEnt’s new video slot, made in association with the 20th Century Fox studios. Net Entertainment had already released its new video slot this month and it plans its next installment later on this month, this time with an adaptation of the long running series of science fiction movies. The base core of the game will revolve around its unique setting, which is heavily influenced by the two movies from the new series: “Dawn of the Planet of the Apes” and “Rise of the Planet of the Apes”. From the early game footage it can be seen that all 10 reels were divided into two equal parts: 5 on the left and 5 on the right, each corresponding to a particular film. Follow the life of Caesar and his army of super intelligent apes, as they take arms against the oppression of their human captors and try to find a place on this planet. With 20 fixed lines at the player’s disposal, the slot machine is going to bring the players a portion of bonus features at that too. 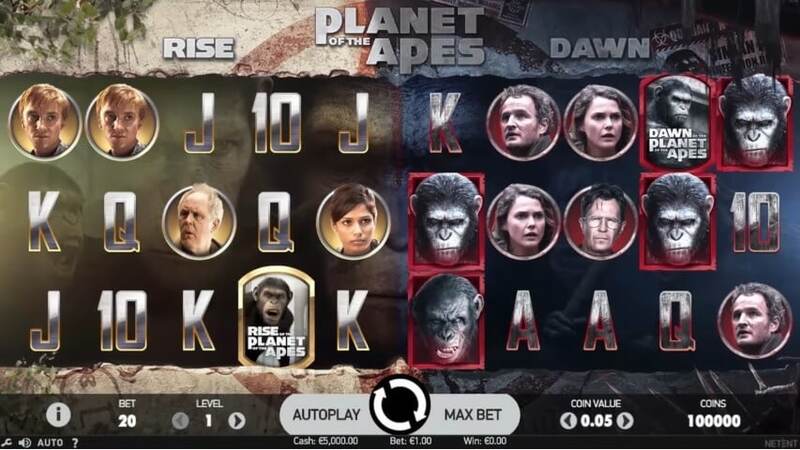 Whether it would be the Rise of the Planet of the Apes or the Dawn of the Planet of the Apes, both areas of the video slot come with their respective characters from those movies. Dawn and Rise Bonus features, Dual encounters, Stacked Wilds, Wild substitutions, Scatter symbols, plus many Dawn and Rise Free Spins – all of this and much more awaits in the Planet of the Apes slot. The game becomes available on October 23rd, introducing the viewers to a brand new piece of software, one that certainly has the potential to revolutionize the entire online casino industry.